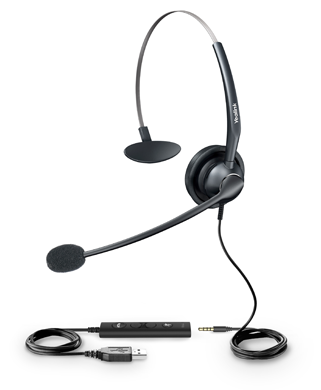 Yealink YHS33-USB is a professional headset with the over-the-head style that eliminates background noise and helps you get in your concentration zone and focus. Coupled with wideband audio technology and HD voice, the YHS33-USB delivers richer and clearer conversations, as well as reduces listening fatigue. Simple plug-and-play setup permits you to merely use the USB port to the USB-supported Yealink IP phones, plug it into the USB port or 3.5mm jack to your laptop, or use the 3.5mm jack straight into your smart device. Get easy access at your fingertips via the intuitive control unit to the frequently-used functions, such as accpet incoming calls, adjust volume and mute the microphone. Yealink YHS33-USB stands its unique position in the market with the combination of exceptional comfort, durable lifecycle, premium quality, and brilliant sound. When you use YHS33-USB in some uncertified communication platforms, as a minimum, it works as audio only.